Engrave your message of love! For weddings, anniversaries, birthdays, graduations, and more. Learn about our custom engravings. We design wooden watches that effortlessly blend form and function. See our collections here. Inspired by the scenic Jura Mountains along the border of France and Switzerland, our newest women’s collection captures the spirit of these natural wonders. 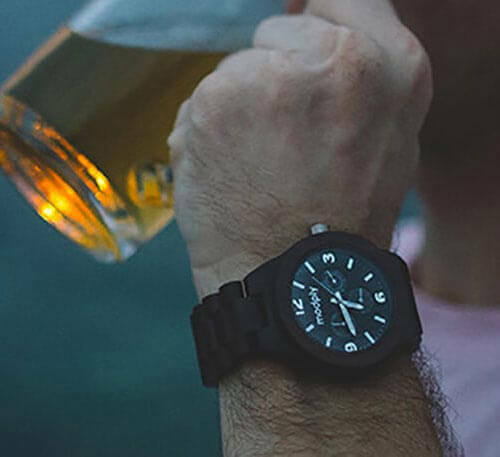 We offer a full range of premium men’s, women’s, and unisex designs and our engraved wooden watches can be personalized with a message of your choosing. This level of customization makes our personalized wooden watches gifts that can be cherished for years to come. 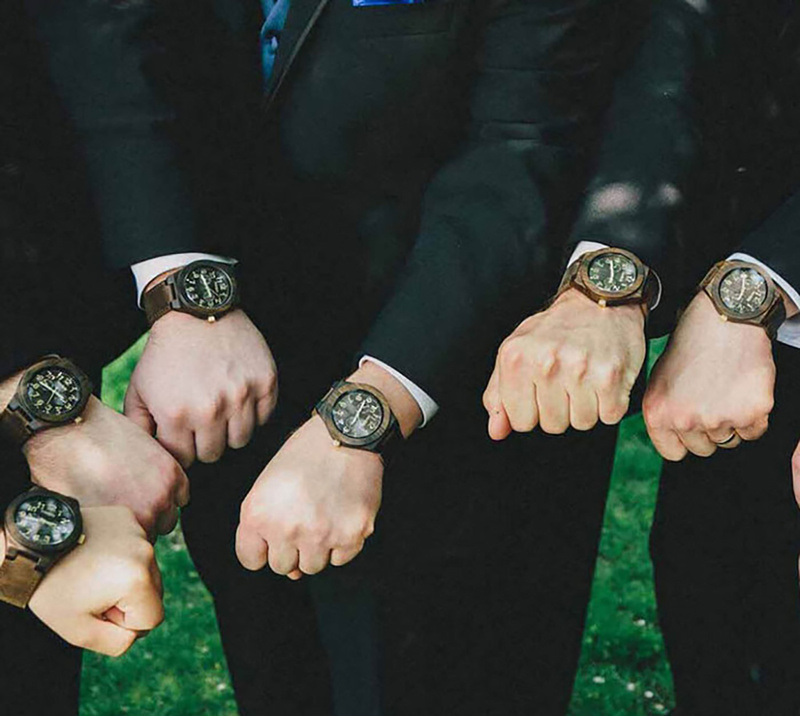 If you’re looking for classy groomsmen gifts, a memorable anniversary present, or even gifts for promotions and graduations, Modply is the perfect place to find something special. We set ourselves apart from other wood watchmakers by providing unique ways for you to commemorate important moments in life. Our premium timepieces are designed to stand out. They’re durable accessories constructed from natural wood available in a variety of grain patterns, subtle hues, and polished finishes. Our watches also feature wood dials, date windows, a non-glare and scratch-resistant mineral glass face, and stainless-steel clasps. Designed to be water-resistant, our personalized wooden watches can be worn daily as your go-to everyday accessory or as unique statement pieces. With authentic American design influences, our timepieces are handcrafted featuring precise, Japanese quartz movements, ensuring that each watch performs as great as it looks. Each watch band features wood or leather, and every wood band has links designed to be easily removed. These sizing adjustments can be made using the special tool included with every watch you order, or by simply visiting your local jeweler. We offer same or next business day shipping. However, please note it normally takes one to two additional business days to process an engraving request. Additionally, we offer a comprehensive 12-month warranty that ensures you get the most out of your Modply watch. In the rare event your watch doesn’t function exactly as it should, we make it easy to repair or replace at no additional charge! Read more about our warranty here. Check us out on Facebook, Twitter, and Instagram. 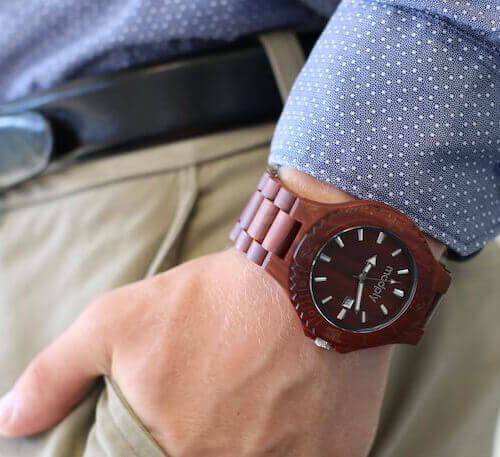 Be sure to take a look at our blog for helpful tips about wearing and adjusting your Modply watch. When you’re ready to shop for your next watch, please visit our online store to see our premium collections, featuring either an all-wood construction or a combination of a wood case paired with a leather band!